"You said you thought you heard something? Grab his chart… thanks. His drip… no, tubes are fine. His heart rate’s been pretty stable and his breathing's been steady." "Wait.. there it is. No. Don’t touch him. His fingers twitched and it looks like his eyes are moving under there. " "My shackles! Can't you see 'em?" "Looks like he’s smiling now... almost."" "No. No thanks. Don't fill her up, I don't need any more." "And my shift’s almost over... Dr. Mercy is due here in just a little while. You might want to check on the other patients. I be finishing my rounds after I make a few minor adjustments. Move along." "Well, well... what do you know?" Take too much and you lose it all...sometimes that's the point though. You gotta say your goodbyes before they fill er up...they look like they are there but once it's flowing they are already gone. I have never been chained to anything but a lot of things are chained to me...pieces of myself that I drag..the weight is too much sometimes. I have had them so long I am scared to cut them. Like a prisoner that re offends to go back into jail where it is safe and controlled and predictable...comfortable....makes no sense yet makes all the sense in the world. I will keep these chains. Knowing when to say when... guess a lot depends on who is pouring. Yeah... nice to say goodbye before things kind of empty themselves all over the place. Hadn't thought too much about that. Thanks. Chains 'n baggage make for good ballast. There are definitely good things to have on hand, but understanding the weight of issues, just when I get one set figured out, there's heavier stuff around the corner. So, not getting too comfortable, that also makes a lot of sense. I'm having a time untangling a lot of stuff. And trying not to flatline. Fortunately, there should still plenty of time (looks at the cup). Meaningful information... we definitely can fall into patterns if we let ourselves simply 'go with the flow' instead of thinking or paying attention to what's going on. Organized religion answers the big questions for a large number of people, particularly the masses. For me, that simply doesn't work. I remember mentioning 'Primer' to a quantum physicist who happened to be very willing to slip into to vernacular when explaining what he liked to think about. He also happened to really like playing music, mainly acoustic guitar. Hear the budget for that movie was insanely small in addition to the use of very real sounding 'math-talk'. So did your son finally get bragging rights? Can you do it? I also want to very much own a Greedy Cup. Actually come to think of it, these should be standard issue at 7-11 instead of the Big Gulp people tend to over indulge in. Keep the masses hopped up on sugar, caffeine, preservatives, trans fats.... it will make controlling them easier. Yes, Son mixes the cube up in the morning and a few minutes later, it's back on the table sporting solid colors. 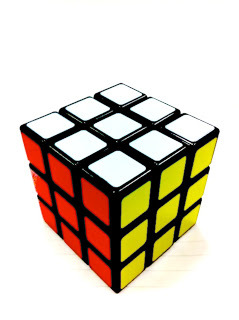 Although it took me a little more than three weeks to be able to solve it consistently and in a timely fashion without looking at the instructions, Internet wisdom says 5th graders can learn to do it in about a third of that time. About that ban on undersized beverages, I can see it saving the lives of folks who somehow find themselves in the summer heat straying from the I-5 corridor anywhere between Bakersfield and Sacramento. Ice tea saves lives; it really does.